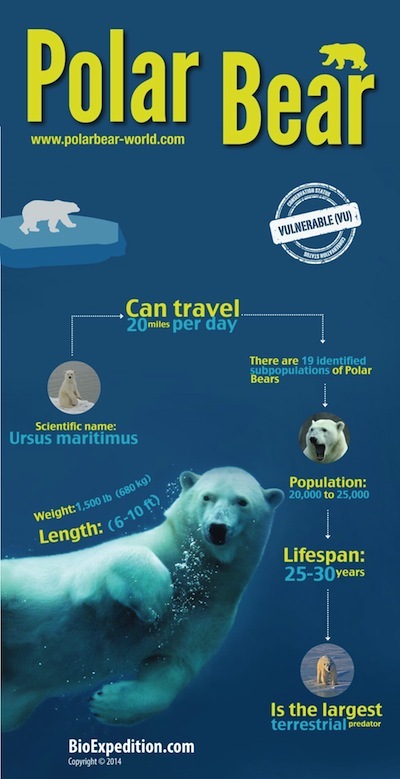 Polar Bear Information. Facts about Polar Bears, Habitat, Feeding, Anatomy, Communication, Reproduction, Predators, Social Structure, Polar Bears and humans and Polar Bear Conservation. Polar Bear Conservation. There were no restrictions for hunting polar bears for long time which caused a great drop in the number of polar bear available. While polar bear habitat is not suitable for human development, human activities and their consequences have impacted polar bears. Social Structure, and Conservation about Polar Bears. Polar Bears only live where it is very cold around the Arctic Region. The only exception are those that live in captivity within zoos around the world. They have been able to adapt to the warmer climate very well in such locations. This is why many experts believe they were isolated to the Arctic millions of years ago due to environmental changes rather than being there out of necessity. They are solitary animals, with bodies designed to handle the extremely cold weather. They are fascinating animals to watch too. They evolved from Brown Bears more than 38 million years ago, and now there are 19 species of them known in the world. They main food source for Polar Bears are various species of seals. These bears spend most of their life in the water. While Polar Bears can walk, they do so awkwardly. They are heavy animals so it takes a great deal of energy for them to walk around. They also aren’t fast enough to really be able to kill their prey this way. The fact that they can walk when needed though as well as do so well in the water makes Polar Bears one of the most versatile animals in the world. Female Polar Bears that are pregnant are the only ones that hibernate. Their cubs are born while they are hibernating, and instinctively are able to get to the source of the mother’s milk on their own. They will remain in the den with their mother for several months before they emerge to the outside world. There are plenty of threats out there for young Polar Bears, and more than half of them will die within the first year of life. There are many misconceptions out there about Polar Bears. Many of them involve the image that these are very aggressive animals and that they love to eat humans. They are very protective of themselves though and they will attack if provoked or they feel that they are in danger. There is still plenty that we don’t know about the Polar Bear so more research is needed. Polar Bears are solitary animals other than when they are ready to mate. 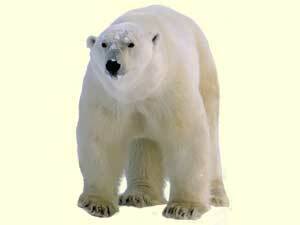 Polar Bears evolved from the Brown Bear more than 38 million years ago. They are extremely intelligent animals and they do what they must in order to survive. They have the ability to slow their heart rate rather than hibernating as other types of bears do. They also have the ability to live off their fat reserves of blubber which is what seals and whales also do. Since a female Polar Bear will only reproduce once every three years, this is a concern and a reason for low numbers. Generally she will give birth to a set of cubs and nurse them for 2 ½ or 3 years. When a female Polar Bear is stressed out due to changes in their living environment or a lack of food though they won’t engage in reproducing at all. This is just one more reason why conservation efforts to help them in their natural environment need to be in place. It is believed that Polar Bears go through a molting period where they will lose some of their fur. However, it isn’t a complete loss of the old in an effort for the fur to be completely replaced. Instead it occurs as the weather gets warmer for them to keep their body temperatures regulated. This is why some Polar Bears will molt more than others. The body of a Polar Bear is one that is quite unique. For example they are known to have toxic levels of Vitamin A in their liver. While this doesn’t seem to negatively affect them, it took a long time in history for those consuming Polar Bear for food to realize the dangers it held for them. There are plenty of conservation efforts in place for the Polar Bear at this time. As of 2008 they have been on the Endangered Animals list. They current population is estimated to be about 25,000 at the most. Hopefully such conservation efforts aren’t too late to help increase those numbers.